(Nanowerk News) Gene therapy has great potential to treat intractable diseases such as cancer, arterial sclerosis, and Parkinson's disease. Successful gene therapy requires a gene vector that can deliver the therapeutic gene selectively to the target site. However, the concern is that conventional gene vectors can cause non-selective transfection to normal organs, whereby genetic material infiltrates healthy cells and leads to unfavorable side effects. Now, Nobuhiro Nishiyama and Takahiro Nomoto from Tokyo Institute of Technology, together with Kazunori Kataoka from the University of Tokyo, have developed a novel light-responsive nanomachine as a new type of gene vector ("Three-layered polyplex micelle as a multifunctional nanocarrier platform for light-induced systemic gene transfer"). The nanomachine allowed the team to accomplish systemic light-selective gene transfection into a tumor for the first time. A new nanomachine created by researchers at Tokyo Tech promotes gene transfection in cancer tumors in mice, using a light-induced gene transfer system. The researchers created the nanomachine using sequential self-assembly of DNA, ABC-type triblock copolymer, and dendrimeric photosensitizer in water. 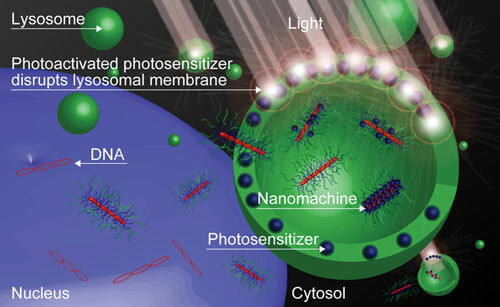 The device has three functional nanocompartments: a hydrophilic shell which allows the nanomachine to avoid interaction with biological components en-route to its intended destination, a photosensitizer-loaded intermediate layer for promoting gene transfection efficiency in a light-induced manner, and DNA-loaded core. Using their new gene vector, Nishiyama and his team accomplished systemic light-selective gene transfer into a subcutaneous tumor in a mouse. Results also showed that the nanomachine was 100 times more efficient at gene transfection to cultured cells than other techniques. Owing to its light-selectivity, the light-responsive nanomachine could offer a non-invasive gene therapy for cancer in the future.